peterwellsblog. : The obtuseness of the physical envelope. I began to question my search for physical evidence. The prison was opened in 1862, and only closed in the 1990s. It used to be a backpackers. Today it is a kind of free enterprise museum, promoted by the Lonely Planet’s ‘Blue List’as ‘good value’. It was an overcast morning, a thin veil of cloud occluding the sun. I was pleased about this, as the weather recently had been oppressively heavy. I listened to the sound of the waves as I stood there, waiting. It was still that low tide time of the year, when everything is exhausted by the aftermath of Christmas and New Year. A young man came out, dressed as a prison guard. Having paid my $20 the guide turned out to be a pleasant young woman with a strong foreign accent. In fact the people running the museum seemed to be migrants. I thought about what this meant: obviously the prison tour business seemed to be an ‘opportunity’. And true enough, on a holiday morning, probably twenty people turned up. There were two tours a day. I was anxious, of course, to see the old part of the prison. 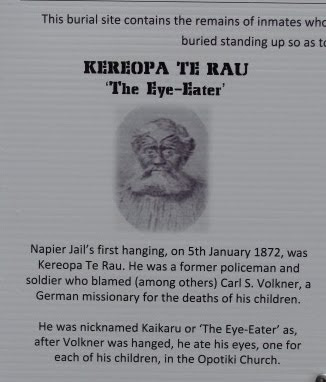 I wanted to imagine myself back to December 1871 when Kereopa Te Rau was brought to the prison, then put on trial for the murder of the Reverend Volkner at Opotiki. 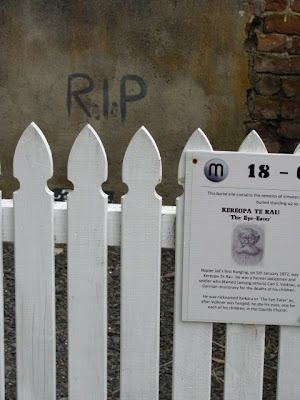 Kereopa Te Rau was notorious as a ‘Hau Hau’. He seemed to be high priest of the bloodbath proceedings, following Volkner’s hanging. He swallowed Volkner’s eyes, one for the Queen and one for the State. He choked on the second eye and he believed this was an omen leading to his downfall. The entire killing of Volkner was drenched in hysteria, omens and rituals. Historian Judith Binney, in her customary role of Savanorola, always talks of Volkner’s death as an ‘execution’. Volkner was a ‘spy’ giving information to the government on hostile Maori forces. He was also a pious and somewhat naive German who thought he needed to get back to his flock, to help them through their latest bout of sickness. So it was slightly more mixed up - more human - than Binney makes out. Also I kind of doubt that an ‘execution’ incorporated beheading, drinking of the blood of the dead man, the swallowing of his eyes and the contemptuous throwing of his corpse into a latrine to be eaten by dogs. Kereopa Te Rau became a kind of terrorist in the mind of Pakeha settlers. But not all. Enter William Colenso who wrote a long and passionate defence of Kereopa in a letter to the papers called ‘Fiat Justitia’. His motto was ‘see the other side of the story’ and he tried to say that, by 1871 (six years after Volkner’s death), others had been pardoned for the offence, that vast land confiscations had subsequentlty taken place as well as a lot of Maori deaths - ‘what more could be done?’ he asked, by way of retribution. British power was at its peak in the nineteenth century. It was the global superpower. But in this pamphlet Colenso argued passionately for a different understanding of justice. The jury was out a token ten minutes before the ‘death by hanging’ verdict was brought in. Kereopa spent the long days of Christmas and New Year in Napier prison, awaiting his execution. So what did I hope to find by going there on the day of his execution, 139 years later? (He was executed at 8am. I was there at 9.30am) I wasn’t sure. In some ways it took the form of a pilgrimage. I hoped to gain some insight, some sense of otherness by simply standing on the spot. X marks the spot, once again. Also, simply by going to a place, you are paying homage to the past. You are trying to connect up with that most fugitive of things - the past. But my problem became immediately apparent, once the tour took off. The prison had altered a lot since 1872. The outside wall was created as late as 1906 and the interior of the prison is a hotchpotch of buildings, some dating from the 1980s. I was always searching for the oldest layer. The old wooden building, I thought, had the look of early Napier. And then I saw the very back wall, made of stone which looked like it might even have been imported from Australia. Later we were taken through into the ‘graveyard’. 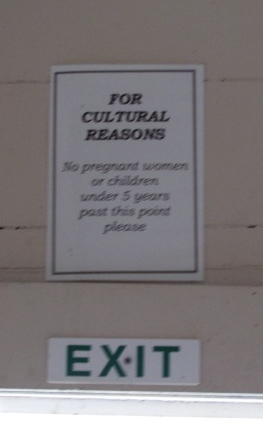 I noted the cautionary note over the door, to placate Maori sensibilities. It was ignored - or was invisible to the people passing under it. Outside the guide talked about the people buried there. I knew Kereopa Te Rau was not buried there. Nevertheless I obediantly marked the spot in the contemporary manner: by taking a photo. I noted the interesting differences in the story-telling. Here the eyes represented his dead children, killed by Pakeha soldiers. He became a kind of family man seeking justifiable revenge. Or was that Russell Crowe in the Gladiator? It's easy enough to get things confused. Finally, and as the last frisson, we were taken through to the part of the prison where people were hanged. 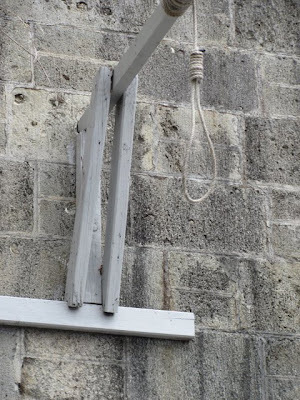 A somewhat rudimentary hanging device was placed there. The guide talked about how people attended the hangings, as one attended a particularly good theatrical event. There were steps to the right of the entrance which allowed people to walk along to the top of the walls, and get an excellent view downwards. I wondered how much entrance to this ‘front seat in the circle’ position cost. The young man in prison guard uniform seemed particularly agitated about this area. When he spoke he revealed he was an Englishman. He had those beautiful cornflower blue eyes which must have been so astonishing to early Maori - to whom blue was an especially rare colour. He told me that the hangman, an Irishman called Long, had his own hanging device, in a kind of kitset assemblage, which he took from hanging to hanging. The spine was quickly broken so the death was relatively painless. He was knowledgeable about the way the actual noose was callibrated. He seemed excited by his knowledge and I wondered about the sort of person who enjoyed sleeping in a cell, at night, listening, as he said, to strange sounds. I had no particular feeling from being there on the spot on the exact day so many years later. When I mentioned to the young man, in passing, that today was the day of the execution, he said he knew. He had thought it was yesterday. I thanked the young guide and asked her where she was from. Argentina, she said, immediately oplogising for her slightly clotted English. I left soon after that, uncertain about exactly what it was I had obtained by going there. But in one way it is too soon to know. These things have a way of lying in the subconscious, like a body in the tide, being pulled to and fro, before being dleivered to their resting place. There was a weight of greif in that building though, of lost souls and souls removed from the body of their family and landscape. People were isolated and brutalised there. They were there, after all, to be punished. Some of this tragic intensity still lingers. Colenso had tried to stop the unstoppable. He had tried to articulate a conscience at a time the majority of Pakeha had no interest in hearing ‘the other side of the story’. Today we sometimes seem to only hear ‘the other side of the story’. It is one of the fascinating things about William Colenso: he tried to walk the knife-edge of the difference. Little wonder that occasionally, when he slipped and fell, he got his legs and arms - and perhaps a more tender part of his anatomy - almost sliced off. And I guess that is why I ended up in Napier prison, five days after New Year - in search of the faintest reverberation of a long ago - and seemingly almost forgotten - hanging. As I left the waves sounded louder. My Mother used to work as a tourist guide at Napier Prison. She never said, but I got the impression that only a rudimentary amount of research was done by the current owners and that most of the "facts" used in the tour presentation are selected more for their theatrical effect than their accuracy. to start this season.Performance of Rolex Daytona the pros and consNote the brand impossible consumers can bring, you can create a collaboration of cross-platform. Many Replica Watches , in order to achieve various purposes of consumers, is sponsoring a sporting event.For example, the Swiss handbagreplica manufacturer, Omega-depth the XXII Winter Olympic Games, Replica handbags as a multi-channel initiatives, described the role of Replica watches UK the mechanism behind.